Each week, we feature a favourite collaboration between brand and creator, this week is the turn of @luba.shraga and Elite Coffee. Elite Coffee is Israel's most popular coffee brand, who's mission is 'sharing passion for coffee'. 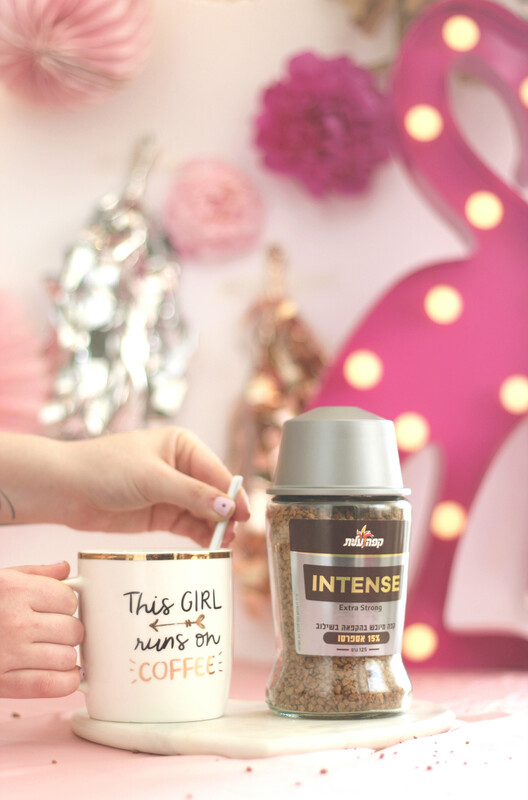 In celebration of the launch of their new Intense instant coffee, they wanted to work with the best creators in Israel to share content of them enjoying the new coffee, and of course, sharing their passion for coffee. Luba is a lifestyle blogger, social media strategist and content creator based in Tel Aviv. Her style is bright and beautiful with a focus on fashion, beauty and florals. I had recently bought a lovely bouquet of Peonies and just before it was time to say goodbye to them - I felt inspired to use them as a backdrop. They have completely set the tone of the shoot, both texture and colour wise. I fell in love with the idea of focusing on the coffee and the mug - yet having all types of different elements in the background, I feel like there's a lot to take in whilst looking at the photo and that's what I was aiming towards. I felt like the campaign organically integrated into my feed and my lifestyle - which is very important for me in terms of choosing projects to work on. It was great! It was an opportunity for me to build a set similar to my aesthetics and yet somewhat different, just slightly out of my comfort zone. Thanks Luba and Elite Coffee!